"Charles Meakin had a manufactory for American granite-ware at the Eastwood Pottery, Lichfield Street, from 1883 to 1889." 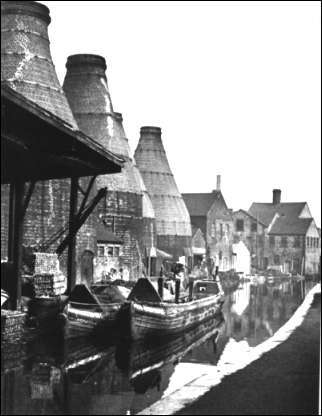 Eastwood Pottery, which had been established by Charles, was absorbed in the larger company of his brothers James and George in 1887. The Eastwood Pottery was a well-planned factory with three biscuit and four glost ovens, the whole lay-out being designed to ensure effective labour-saving production. 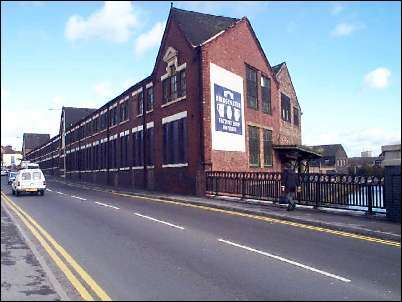 The Eastwood factory was sold in 1958 and the Meakin company enlarged the Eagle Pottery. At the turn of the 20thC the works is run by the Bridgewater Pottery. 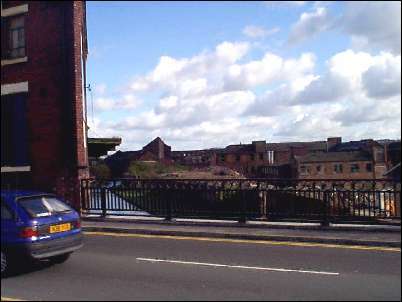 the Caldon Canal is visible between the railings of the bridge on the right of the picture.